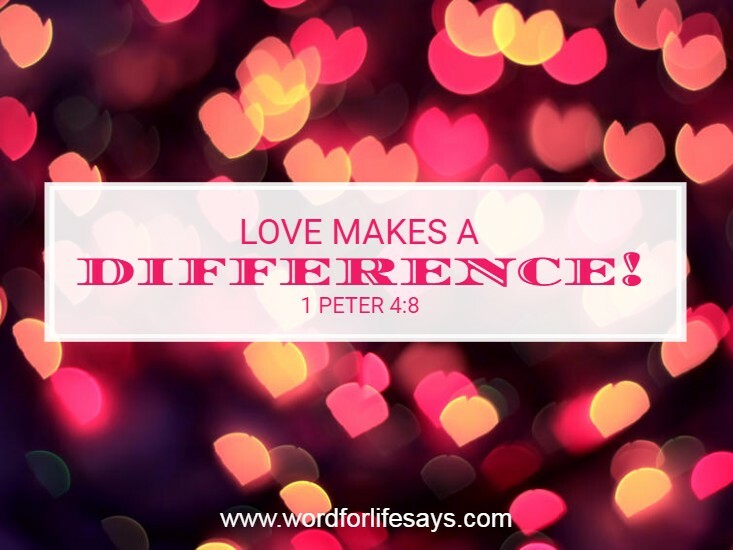 Love makes the difference! There’s no way around it. God is love (1 John 4:8). Jesus died because of love (John 3:16). And now we are admonished to have that same “fervent charity/love” toward one another. Christians are to have a love for each other that cannot be easily extinguished by life’s difficulties. Paul wrote, “Ye have been called unto liberty; only use not liberty for an occasion to the flesh, but by love serve one another,” (Gal. 5:13; emphasis mine). The love and compassion we have in us should be poured out freely to one another. “For charity/love shall cover the multitude of sins.” God’s love, through His Son Jesus, covered a “multitude” of my sins and yours. We are to be imitators of our heavenly Father. Proverbs 10:12 tells us, “Hatred stirreth up strifes: but love covereth all sins.” Both of these verses pronounce love as a covering. It’s not that we don’t see, feel or hurt at the wrongs of others, it’s all about what we choose to do with it. Much like God (although we can never touch the capacity of His love), our love is to be so on-fire for one another that it causes us to look beyond the faults of others and see to the core of their very need. That’s how love makes a difference!